W.D. 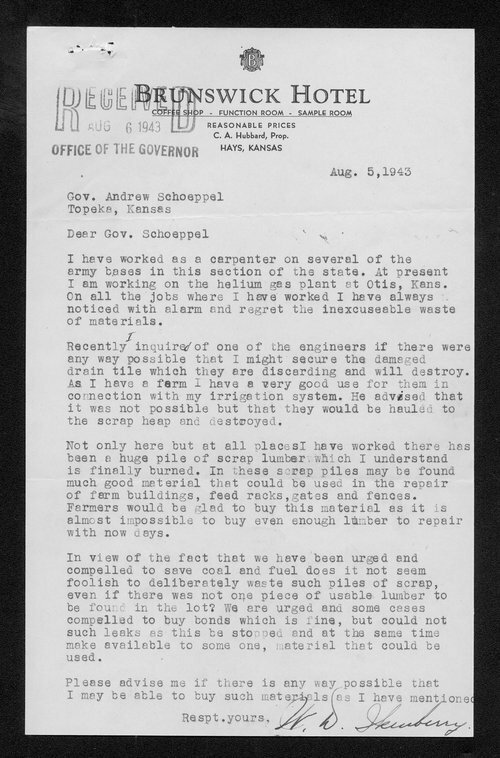 Ikenberry, a carpenter from Hay, Kansas, informs Governor Schoeppel that he believes that the excess lumber being used to construct the many U.S. military facilities in the state of Kansas could be put to use in repairing other useful structures such as farm buildings, gates, and fences. In response, W.F. Turrentine, Jr., informs Ikenberry that Governor Schoeppel has already contacted the federal government about the excess wood and that they are willing to cooperate in the matter. This item can be used in conjunction with other items on the home front during World War II to provide students with an interesting example of how ordinary citizens worked to conserve during the conflict.